At the end of this post, see how you can win a copy of, "The Begotten." What do a wealthy woman, a priest, a knight, and a child have in common? They're part of, "The Gifted." They share a 5,000 year old secret, and it's time for it to be exposed. The church wants to keep it under wraps, while evil people want to subvert and use it. This suspenseful tale, set in Italy during 1339, kept my heart in my mouth. Who would triumph? How could a small band overcome the powerful forces seeking to destroy them? 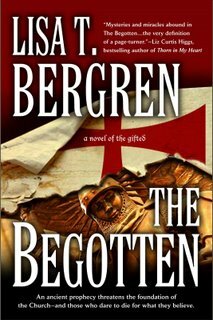 If you like medieval historicals and speculative fiction, you'll love Lisa T. Bergren's book, "The Begotten." Well-written, knock-your-socks-off settings, and a story you won't soon forget make this book a winner. To win a copy of, "The Begotten:"
1) Leave a comment in the spam-busting format: susanjreinhardt (at) gmail (dot) com. Sorry - no email address in your comment, no entry. 2) Become a Follower or let me know you're a Follower, and you get an extra entry. 3) Post the contest on your blog, send me an email with the link, and get another entry. 4) Deadline: Monday, 5/17/10, at midnight. The winner will be emailed and announced on the blog on Tues., 5/18/10. 5) Eligibility: U.S. residents only. Void where prohibited by law. The winner takes all responsibility for their eligibility. Disclaimer: I have not received any payment for this review. The book was won in a blog giveaway, and I'm sharing it in celebration of my 2nd Blogoversary. I've heard of her but never read her books. Good to know they're great! Count me in! But if I win, you don't have to mail it to China, my next three weeks' addy! Yay! I finally got Blogger comment moderation to work this morning. Have fun in China! Please include your email address in the comments. What a great setting and time! Please enter me. I'm a follower. I love Lisa's books. She is a very talented writer. I would love to win a copy of The Begotten - sounds intriguing. Have a wonderful day, Susan! Thanks for entering the drawing. I thought some readers might like this time period. I'm looking forward to reading her sequel, "The Betrayed." Her writing is topnotch. Oops on me. Why don't I EVER read the rules? Thanks for adding your email. If you wish to enter the drawing, I'll need your email address. I've never read Bergren, but have read reviews for The Begotten and it sounds great. I'm a follower through google reader. I've read some of Lisa's books and enjoyed them very much. Haven't read this one though, so thanks for sharing the info about it. It sounds great. BTW - Congrats on your blogoversary! I'd love to be entered, and I am a follower. Hi Susan. This book sounds very interesting. Thanks for sharing. I am also a follower of your great blog. I am not sure if I have read any of her books, but, I am going to have to check them out. As an aspiring writer, my genre is medieval times. And I love that part of my research is reading other's works in that time period. I would love to be entered in the contest, if I am eligible, I have already blogged about it. Oh, and I am a follower. This book sound fantastic, Susan. I can't enter your contest because I am from north of your border. But it is on my reading list now. I'm glad I dropped by! Susan: Wow, this one sounds like a winner! And I should be done with reading "The Help" by the time you draw my name--ahahhahahahaaa!! I am reading again. I tried to do other things for a week and wow, I need a good book. This one sounds like a winner. Susan, you always find the most interesting books! Your last recommendation with me was a hit. Oh, I'm sorry. If it were up to me, I'd enter you, but it's against the law. LOL! I assign a number to each entry and put them in a plain ol' grocery bag. I mix 'em up good, and pray before I stick my hand in and draw out a number. I don't even know who won until I check the master list. Thanks for blogging about the contest and entering. You have three entries. I enjoyed this book, and look forward to reading The Betrayed. It's part of the series. "spam-busting format: susanjreinhardt (at) gmail (dot) com." I wondered why folks often left their addys that way. Now I know! slking1 (at) sbcglobal (dot) com. Oh, you'd love this book, Nancy. Even if you don't win, maybe your local library can order a copy. LOL! I'm glad I cleared up that mystery for you. If you use your regular email address, "bots" can hunt it down and send you spam. Oh, I'm so glad! 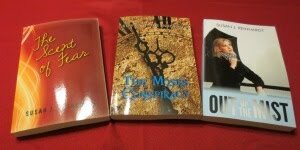 I try to bring books I enjoy in a variety of genres. Thanks for commenting and entering the drawing. Thanks for entering the giveaway. You have three entries for commenting, following, and blogging about the contest. I've got so many books piled up on my reading table now it gives me hives! I know I'd love this tale, so it'll just have to sit on my Wish List until I get through the present projects. Count me in! I am a follower! I get nervous if I DON'T have a stash of books. LOL!